With the frigid temperatures, the local ‘land’ birds in our community have been scarce, only out from their shelter to seek food. Sunday we awoke to a gorgeous sunny morning and the winds had died down, finally. Made the morning feel like early spring. That wasn’t only my opinion, I could hear land birds singing their enjoyment as well! This fine-looking fella was no exception. He, too, was very happy to feel the sun’s warmth. So much so, he obliged in giving me a nice photo session. 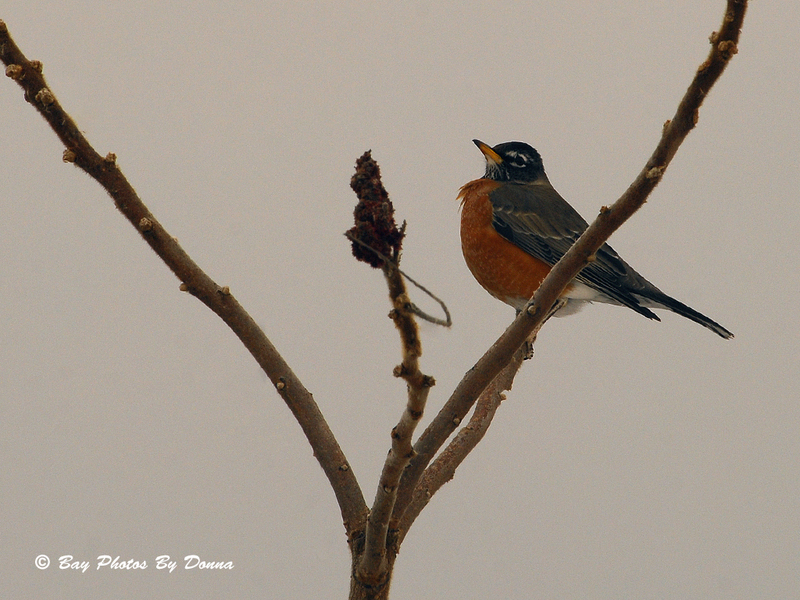 I hadn’t seen a robin for so long, it was a happy sighting…..and a promise Spring will be here soon! It’s nice to see great photos of a robin, but I’m afraid that it’s a little confused as far as how close spring is. Very handsome. I love the shot with the berries around the Robin. 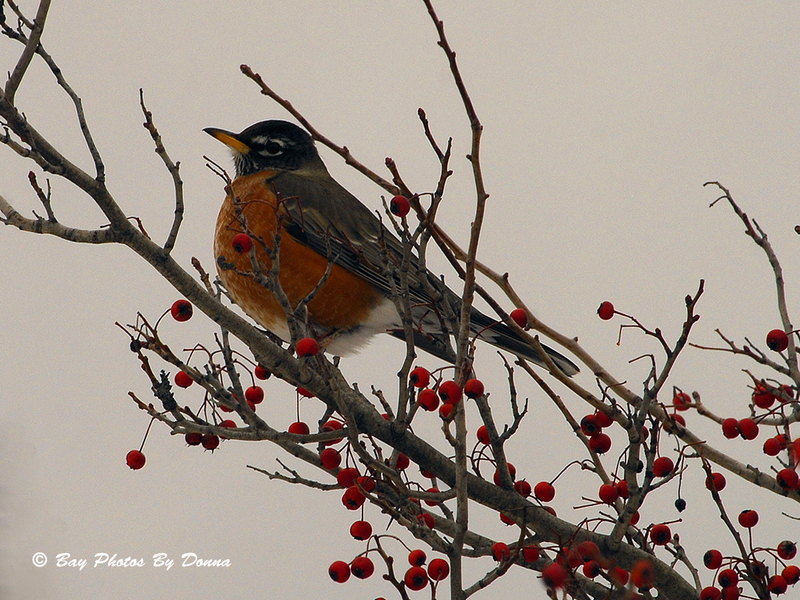 I was actually sitting still in my car trying to capture another bird, when the Robin flew to the berry tree. I guess he thought I should being photographing him instead! lol Berries are always an added plus with color in a bird shot. They’re are Robins around Madison all winter long, but I never see them in my yard, not enough berries to eat, I suppose. When they do show up I feel spring is right around the corner. Can’t come fast enough for me! Thanks for these pics though! Oh, spring! It will be a while but I will take this as a promise. 49 more days, Jane! 🙂 And for you, I know it can’t come soon enough with all that Canada snow and cold! I have become a real “wuss”. The freeze/thaw cycles have left so many deep icy ruts and crust on the snow that is left-not great for skiing walking or skating on rinks. Terrific bird in a beautiful setting! Great pics! Thanks Phil! I love bird captures when berries are in the shot, and I finally lucked out with one for myself. Just wish it hadn’t been so cloudy a day…. Wow a robin…could this be a sign of Spring? Great photos too Donna! They always do stand proud, don’t they?! 🙂 Thanks Becky!